Share or export your canvas to showcase a specific portion of your folio. Duplicate it. Or delete permanently. To export (paid feature) go to the 3-dot canvas dropdown menu at the top left and select “Export.” Learn more about exports. 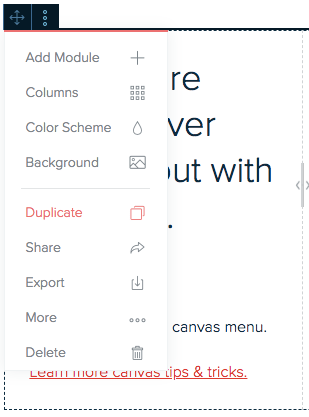 To share a canvas as a weblink, go to the dropdown menu and select “Share.” You must turn on link sharing for your folio. Learn more about sharing links. If you want to delete a canvas, select “Delete” from the dropdown menu. Be careful, once deleted, you will only be able to undo this by reverting to an old version of your folio.